Happy Friday, and all that jazz! How's everybody doing on this fine morning? All is well here. It's been busy as usual but I have found my way to the craft cave a few times and I've even managed to finish a few cards. Here's one that I completed using PK-159 Thinking of you bear stamp set from Peachy Keen Stamps. I colored this cutie with my Copic markers using a new technique that I learned at the Copic Color and Ink Workshop I attended in Anaheim, CA in January. We learned so many great tips and techniques, and it's been fun to come home and put them into action. For the card layout, I followed this weeks sketch challenge at Splitcoaststampers. Boy, was this one EVER difficult for me, and not because it is a difficult sketch at all, but because I find it nearly impossible NOT to include something that sparkles, glitters, ties, or dangles. The sketch was clean and simple, and I did my best to keep the card the same. Way outside of the box for me, but I have to admit I kinda like it, and when you've got an image as cute as this to work with, it pretty much stands on its' own, with no need for much fanfare around it. It's just flippin' adorable the way it is! I am also entering this card in the "Color With Texture Challenge" in the Copic Challenge Group at My Creative Classroom. Fun stuff right there! This is such a sweet stamp set! I added the "I Love You " Sentiment from the PKSC-13 January 2013 stamp set. These teddy bear stamps have been SO popular!! It's pretty easy to see why, though. There's a new release and a BIG SALE going on right now at Peachy Keen. ALL of the new releases are specially priced for one full week after the release, which means that you've got until Tuesday evening to get in on the great deals. I've also heard mention of some prizes being awarded, too. 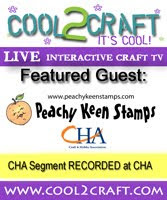 You can find complete details in the Peachy Keen Stamps Store. If you're looking for a little crafty inspiration to get your creative thought process started, we've got a couple of fabulous challenges going on over on The Peachy Keen Connection. Hop over there and check 'em out! You have till midnight Sunday to play along with those for a chance to win a $25 Gift Certificate for each challenge you participate in! Woohoo! Who doesn't love some credit for buying stamps! I know I DO!! What a sweet bear and beautiful card, Lorie! Just beautiful. Your coloring is just gorgeous. Thanks for coloring with us at CMC. Hope to see you for our next challenge! I just love the technique you used to color that darling teddy bear! Wow, what a great technique used to color this sweet bear! It looks so real! Great job with the layout too, your color scheme is perfect to pull one's attention directly to the bear! Well done & thanks for sharing your work! WOW, Lorie, this is fantastic!! I love the little bear and the fun coloring technique you have mastered!! I really like how you colored the bear. The background DP is just perfect. LOVE how you textured your teddy! Those pastel banners in the background are so super sweet! I just loe your little bear. the testure is gorgeous!